Sweating or perspiration is often seen as the most natural thing in the world. The secretion of sweat is undoubtedly a normal and physical necessary function of the human organism. Because of this process, the human being is protected from overheating. The extent and the intensity of the human perspiration secrets do vary quiet a bit. They are controlled by individual situations, and the result is that one individual perspires more quickly than the other under the same condition. Is the “normal” threshold of the perspiration exceeded –which is the case by many people- then the actual function of the gland activity must be questioned. Excess perspiration is then a pathological symptom, an illness, which puts concerned individuals into a stage of suffering. The pathological perspiration is not a rare illness; its cause is complex and can mainly be assigned to the psycho-social area. The medical-psychological experts call this illness “hyperhidrosis”. Based on the proved psycho-social factors of the cause, this lack of function is also called “emotional perspiration”. The excessive sweating does not have psychic causes, a result of it can be psychic illnesses, and therefore a concerned individual is in a vicious situation in regards to his/her perspiration. 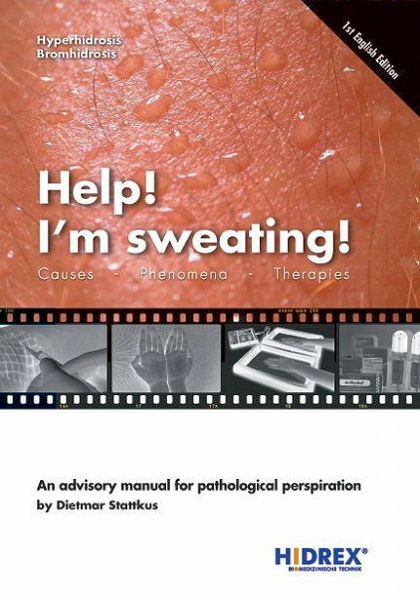 This book provides an advisory and will answer questions in regards to the cause of the phenomena hyperhidrosis, in regards to effective therapeutic measures, and also in regards to the individual having to deal with this problem as well as interested individuals.